The problem with writing is that sometimes, when you lose yourself, your ability to write gets lost as well. And you end up writing, not from your heart, but just words, the one next to the other, with no soul of their own, just like tasteless supermarket carrots placed on a plate, boiled, and served without any herbs or spices- not to mention any butter. So what does a writer do at these moments, which may turn into months, dear reader? 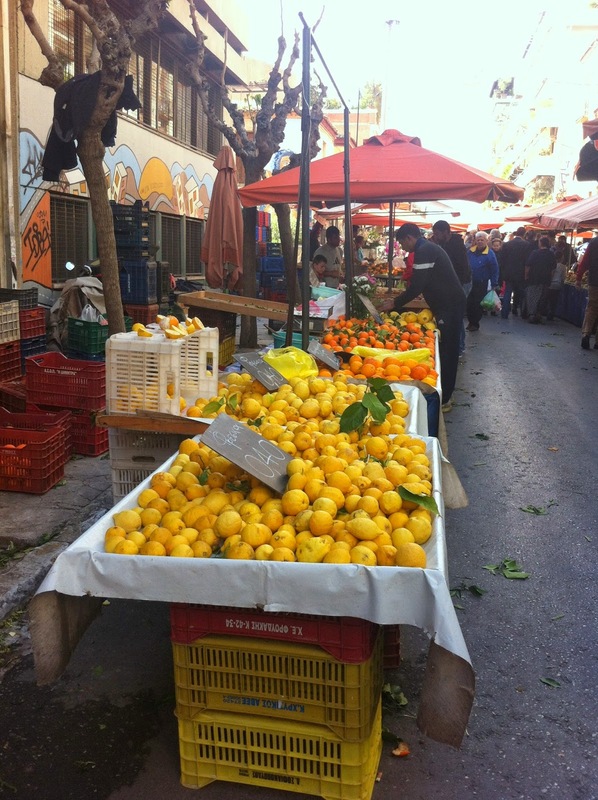 I m not sure what writers usually do, but at times like this, a walk to the weekly farmers’ market in Athens is what brings me peace. Growing up, we never used to go to the farmers’ market – our house was far away. But when I moved to the city centre, the market is just up the road. On Tuesday mornings sellers gather from early dawn and set up (I assume that is the case, because I am always asleep at that time). I like going towards the end, at three in the afternoon. It is quieter then, and, unless you need something specific and are worried if it will still be on offer, it is the time where sellers are more relaxed and fruits and vegetables are much cheaper. 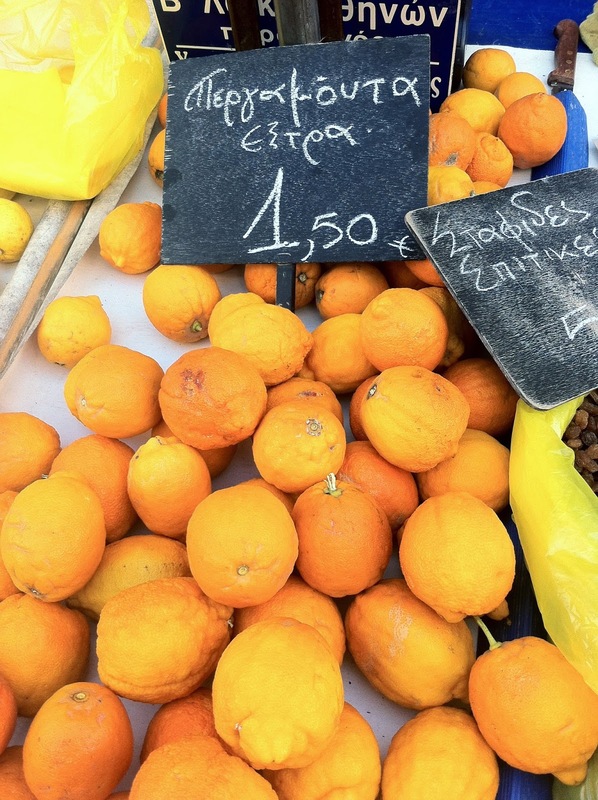 I start by walking up and down twice, a routine that I now always follow, to protect me from buying a bag of oranges, only to discover the same oranges a few stalls down for a much lower price. The sellers yell at me as they see me without any shopping bags, “hey, girl, don’t you need lemons?” I’m quite happy to be called "girl" and not "lady", so I will most probably buy those lemons. After my exploratory walk and a few mental notes on which items I need/want/look-really-interesting, every week I find myself coming home with the following items: something I need (like beetroots for the last batch of roasted winter vegetables), something I don’t need, but was so cheap it would be a pity not to have (this week it was a large bag of apples and pears for half a euro which became a few jars of jam, after peeling, cubing and stewing the fruit with sugar and a vanilla pod), and something which I have never cooked before but looks extremely interesting and the seller usually says is really easy to prepare (like bright yellow aromatic bergamots last week). On my way home, I carry many plastic bags with groceries and I hear the sellers packing up and driving away, leaving the corners of the street with fruits and vegetables which are beginning to rot, waiting to be collected by the garbage men and, more recently, by people in need. There is a cool breeze on my face but the sun is up and I know it is spring because the first peas just appeared. Although some strawberries may appear in the middle of February dear reader (this was really confusing), you can always tell if it is spring, summer, autumn or winter, just by walking around an Athenian farmers’ market. But back to our bergamot story. The bergamot seller, an older man with rough hands, dirty teeth and fuzzy hair looked intimidating at first (they always do). But, putting my embarrassment aside and thinking that I am an anthropologist on fieldwork and asking questions appearing clueless is something I do on a daily basis anyway, I shyly ask if I need to squeeze the bergamots like lemons and get their juice. A valid question, dear reader, since bergamots look like large, rough lemons. Nooooo, the seller says, you NEVER squeeze them. He looks at me like I am the only person in Greece (in the world?) who doesn’t know what to do with bergamots, he then smiles, probably realising that I am getting more interested with his produce than I was before (a lemon-like fruit which you don’t squeeze?!) and shares his recipe for a Greek sweet called "glyko tou koutalou", which entails scrubbing the fruit, removing the peel and discarding the inside (it is the peel that has all the aroma, he said), boiling the peel in water and repeating a few times to remove any bitterness, and finally stewing with sugar. The result is sweet aromatic pieces of thick bergamot peel in a sugary syrup. At least that is what I envision, given his detailed description. You see, dear reader, the problem with these impulse buys at the market is that unless I catch the wave of excitement and prepare something as soon as I come back, like that delicious jam, the fruits and vegetables have a great chance of being left in the fridge for another week. And maybe another. And although I would like to have bergamot "gluko tou koutaliou" in my cupboard, I did make dry martinis flavoured with bergamot peel. The seller did say it is the peel that has all the aroma, right?